When I was eight years old we lived in SoCal, but my parents clearly missed the keys. 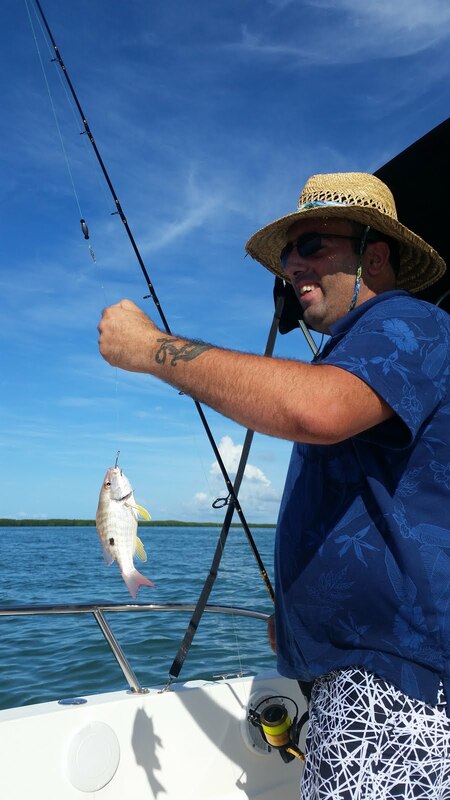 So they took us on a vacation – a few days fishing the keys and a few days in Disneyworld. Being the peculiar kids we were, we probably liked both activities equally. It became a family joke that I caught everything but what could actually be eaten on that trip. I caught a sting ray, a puffer fish, a lizard fish, and believe it or not a starfish ended up on the end of my hook at one point. I’m fairly certain Mr. Foodie fell in love with me all over again when he saw me expertly hook a piece of shrimp and cast for the first time – he likes a lady that can fish. Before we knew it we were getting bites left and right. At first we felt like all we were doing was feeding the fish, but after I started baiting the hooks, we ended up catching the little buggers – emphasis on little. All the fish we caught were undersized. We saw one red snapper, one little hogfish, and a bunch of little yellowtail snappers, but none long enough to take home and grill which was my heart’s desire. Later on, after a trip down google lane, I learned that we were not in deep enough water and didn’t have nearly enough chum to get the big yellowtails. Though we’ve been fishing a lot, we still have a lot to learn about the keys. Even though I didn’t have the pleasure of cleaning and filleting a fish last night, we still had fun fishing and ended up with a tasty dinner designed to use up the remainder of our fresh produce. 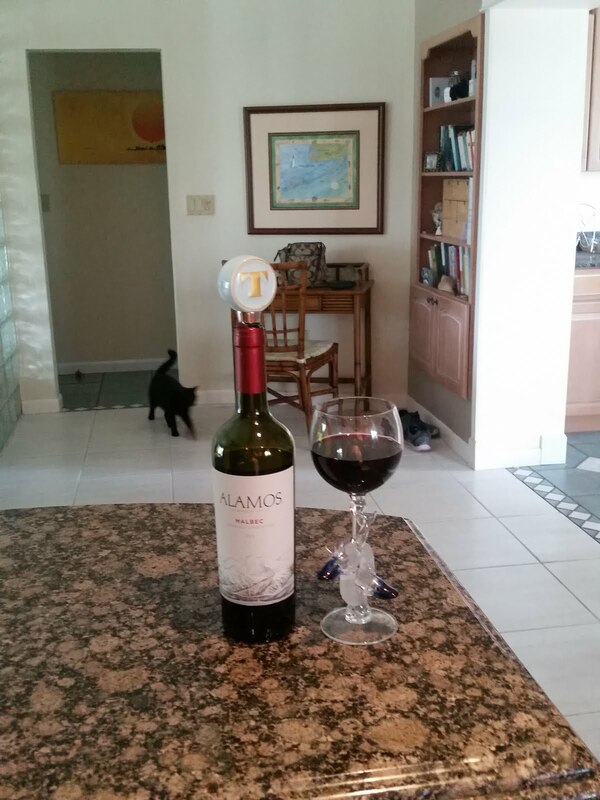 We began dinner prep with a little vino in our fancy glasses – these were gifts to my mother from her friends. Each stem has an adorable tropical figurine incorporated. I chose the sharks this time, but my favorites are the mermaid and the octopus. Our object was to use up the remaining zucchini leftover from Italian night and the kale from our Kale-Turkey soup. I hate seeing produce go to waste, but you know how much kale is in a bunch? A lot. I *still* have some leftover that I plan on crisping in the oven to make homemade kale chips later today. To my delight I found this zucchini/Kale casserole recipe for which I already had all the ingredients I needed. This dish is perhaps a little more complex than I’d like for a weeknight meal, but for a weekend one, it was perfect. 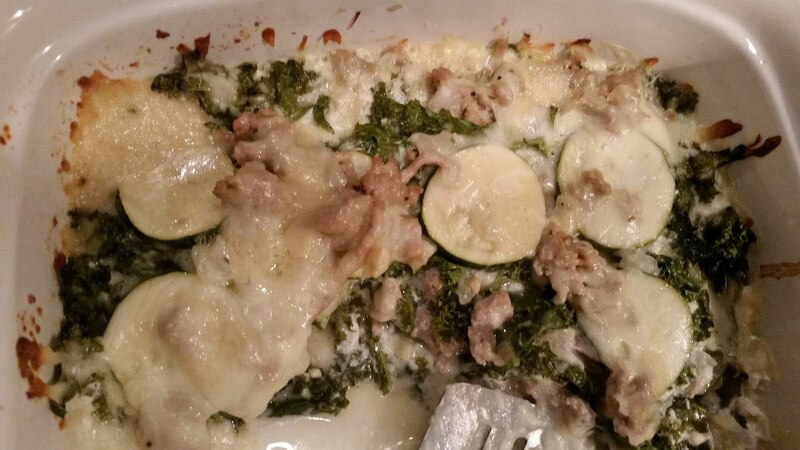 There are basically three things that need to go on before you pop the whole thing in the oven: steaming the zucchini, making the roux (or cheese sauce as the recipe calls it), and cooking up the ground turkey. If you don’t have steam basket (which I don’t), covering the zucchini wheels in a microwave safe dish and zapping them with a little water is the best way to get them steamed – I kept a little bite in mine because I knew they’d continue to cook in the oven. You might feel intimidated by a roux – sounds so fancy, right? It is actually incredibly easy for what it offers you – a thickening agent that you can flavor however you like. I use this same recipe when I make my famous mac and cheese (only more of it) and it works for a wide variety of dishes. Just melt 1/4 cup of butter, mix in 1/4 cup of flour and whisk for a couple minutes until it is golden brown (this helps get the flour taste out of it), then add 2 cups warmed milk slowly, mixing as you go – you’ll end up with a creamy sauce to which you can add cheese (off the heat) or, as this recipe suggests, you can pour the sauce and add the cheese in the casserole by hand. Finally, when you cook up the turkey, start with sauteing the onion/garlic together, then add the meat, cook, drain (you don’t want excess moisture in a casserole), and you’re done! Layer the ingredients as the recipe suggests and pop in the oven, covered, 30 min at 350 and 10 min uncovered. This was absolutely delightful. The cheeses and the veggies were a perfect compliment to one another. It was warm, comforting, and satisfying while also being nutritious and low-carb if you’re into that sort of thing. It was a tasty way to use up our produce. Well I’m off to finally enjoy a birthday gift from my parents to Mr. Foodie and I – brunch at Little Palm Island! I’ve been promising you a description of this magic brunch.